Looking to make a quick quilt using only jelly rolls but want to move beyond the jelly roll race quilt? The Dusk Til Dawn pattern is a good option. The quilt goes together using log cabin techniques that a confident beginner can master. Click 'Read More' to download the free pattern. Pick your four fabric colors, select four shades of each color, pick a neutral background and you're ready to make this beautiful quilt. For a more traditional look, use patterned fabrics instead of solids. Click 'Read More' to download the pattern. 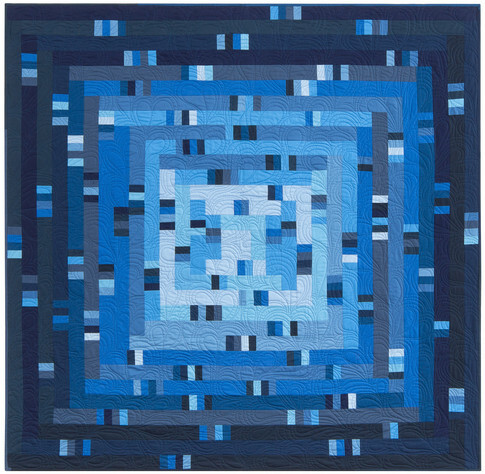 Here's a quilt to show off your quilting skills. 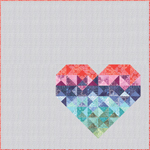 A striking heart in the lower corner creates a splash of color against the neutral background. That background is the perfect canvas for quilting. So drop those feed dogs and put the quilting into your quilt! Who doesn't love boots? This is the quilt for every boot lover. The finished quilt measures 56"x70". Click 'Read More' below to get the pattern. Get ready for spring with Spring Bunny Fun by Stacy Iest Hsu for Moda Fabrics. Spring Bunny Fun features another of Stacy's trademark doll panels. These panels are great weekend projects. The Spring Bunny Fun panel is one full yard and includes 2 bunny dolls, bunny clothes, and 3 baby bunnies. Get the panel and one fat quarter of each of the 13 prints in the Spring Bunny Fun group with the Spring Bunny Fun bundle.